Welcome to Learning Rivers! The seven-in-one program where reading and writing flows. In this program, your child will learn all of the sounds of the English language in a fun and exciting way in only 100 lessons. Children LOVE learning with Learning Rivers! My name is Teri Spray and I am delighted to join you in the journey of learning. My daughter Meredith and I have been teaching children to read and write well who have failed with many other programs. While we were seeing wonderful results, we often wondered if we could help parents to have the same success in their own homes. We wanted to teach parents how to teach their own children and still enjoy the process of learning as well as their progress. Therefore you have a curriculum that is both multi-sensory as well as multi-disciplinary. This program will teach one letter at a time, then you will learn new words, read new stories, and write your own stories. Each Trickles Reading book also includes a set of flash cards to cut out and use for practice and drill with each lesson. Reading Mastery – You will be reading stories from the very beginning because you will only have to master a few sounds and letters. By reading sounds and words to rhythm, you will train the brain to master the skill of decoding sounds. Then this mastery will be applied to reading light and humorous stories to rhythm and rhyme. This makes the reading practice fun. Be sure to cut out your flash cards to help with review. We have even added a reward system to encourage your speedy reader. Then, in only 100 Learning Rivers Lessons, your child will be ready to read chapter books and spell three-syllable words! Spelling Mastery – You will be working on your spelling skills throughout the lesson. First you will learn a sound, then practice writing and saying the sound to rhythm. Then you will read the sound in story form. Next you will make up your own stories with the new sound. Finally, you will use your new sound in words in a personal spelling list. Now your student will NOT forget how to spell words! The spelling has been built into every part of the lesson! Budding Young Authors – Writing stories is fun in Learning Rivers! New words are discovered in each lesson of Trickles Reading. The Trickles Writing then provides even more new words in the form of a word bank. Children can then use this word bank to make their own stories from the story suggestions. If “writer’s block” is a problem, sample stories are provided for your convenience. The Trickles Writing is designed to help children create and illustrate their own personal reading book to read and re-read. (Note: It is perfectly fine for a parent to do most of the story writing in the Trickles Writing until the child’s writing becomes clear and easy to read.) Eventually you will have created your very own set of stories to read again and again to family and friends. Building Brain Power – Learning Rivers builds processing skills as well as reading, writing, and spelling skills all at the same time! The use of the metronome actually imbeds the learning deep into the brain. (Do you still know how to sing your ABC’s to rhythm?) The use of color and picture helps the image stick in the brain. The speed of the metronome increases brain activity. The sound of the metronome “loads” the brain in a good way and causes the brain to build new neural connections. We build the brain like a muscle! With more brain power, your child will learn better! Trickles Reading lessons are designed to flow in this sequence. Some children will complete one or two steps in one session, others will complete only part of a step in a session. We recommend you work in Trickles Reading for a total of three hours per week. These three hours will cover phonics, spelling, reading and writing. Your child’s pace is his/her own, feel free to take your time as you flow down the Learning River. 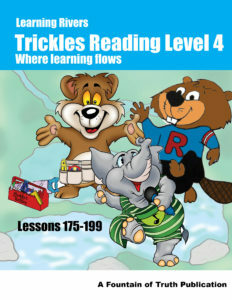 Trickles Reading and Writing Level 1 are a complete Language Arts program for Kindergarten and First Grade. Level 2 is a complete program for First and Second Grade, Level 3 is for Second and Third Grade, and Level 4 is for Third and Fourth Grade. How you schedule your three hours is completely up to you. All you need to add is a basic math curriculum. Picture Letter Trace: Introduce the letter sound and shape. Trace the letter with the finger or pencil. Point out the “picture letter” image to help imbed the shape into the memory. Building Words with Buddy: Buddy is a bear that builds words using the sounds in his toolbox. Parents and children will make new words using the sounds they have learned. Read with Randy: Read a new story with your new words. Activities with Andy: Enjoy a fun activity with Andy Ant, or do a Rollin’ Down the River Review. Trickles Writing story journal: Complete your own story and illustrations in the spaces provided. (At first it is fine for the teacher to write out the story and draw illustrations.) Eventually the child will write the story and draw the illustrations. See the front of Trickles Writing for help with story lines. Spelling: Select three spelling words with each lesson. Test spelling every three lessons in the Spelling Journal at the end of Writing lessons. Use a few new words and one new sight word. Add letter and word writing practice drills to the metronome as needed. Teaching Tips Boxes: These boxes will give you helpful teaching hints along the way for success! This is much easier than a teacher’s edition! Rollin’ Down the River Review: Here your child will practice the letters and sounds they just learned. How to I use a Metronome for Learning? Where should I start my child in Learning Rivers? Look at the following list. If your child needs 6 or more of the listed skills, start at the level listed.